In the Civil Services Prelim Examination, the CSAT paper has been made qualifying in nature from 2015 onwards. The candidates have to score at least qualifying marks in the paper but in case, if a candidate could not be able to score the required qualifying marks in CSAT Paper then his/her other papers will not be evaluated. So, it is important for the candidates to do preparation in such a manner that there must not lay them in any suspicion of underscoring. 1. The population of a town was 3600 three years back. It is 4800 right now. What will be the population three years down the line, if the rate of growth of population has been constant over the years and has been compounding annually? 2. 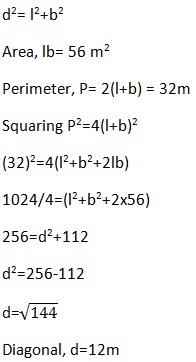 What is the diagonal of a rectangle with perimeter and area, 32m and 56 m2 respectively? Explanation: Let the diagonal of the rectangle be d.
3. A mixture can be prepared by Zinc and copper. Price of Zinc is thrice the price of copper. Rohan sells the mixture at Rs. 4320 per 20g, thereby making a profit of 20%. 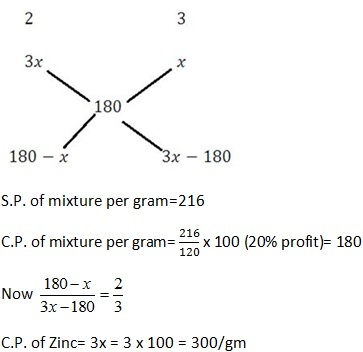 If the ratio of zinc and copper in the mixture be 2 : 3, find the cost price of Zinc. 5. The probability that a diversified company will get a Power project is 2/3 and the probability that he will get an solar energy project is 5/9. If the probability of getting at least one contract is 4/5, what is the probability that he will get both the contracts? Therefore, mother's age now=36 years & daughter's age=9 years. 7. 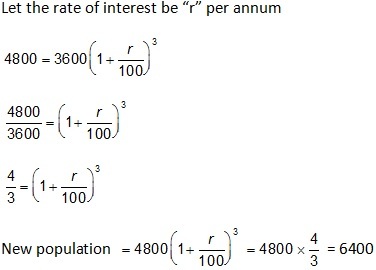 Direction: In each question there are two statements A and B, you have to select the correct answer from (a) to (d) depending upon the sufficiency of data given in the statements to answer the question. a) If statement A alone is sufficient and statement B alone is not sufficient to answer the question. b) If statement B alone is sufficient and statement A alone is not sufficient to answer the question. c) If statements A and B together are sufficient but neither statements alone is sufficient to answer the question. d) If both the statements A and B together are not sufficient to answer the question. Find the profit obtained by the Ramesh at the end of the year, if the profit is Rs 60,000 . A. Ramesh has invested 60,000 and Vishwas 25,000. So the profit of Ramesh =2* 60,000/3=2 *60,000=1, 20,000/3= 40,000. 8. Calculate the total quantity of import during the year? 9. What is the respective ratio of average export and average import during the period? 10. Find the approximate percentage growth in the quantity of the export during the entire period?